Britain’s #1 Beauty Brand, No7, joins Phoenix Fashion Week 2013 as the Official Skincare Brand. Internationally acclaimed TONI&GUY styled the hair and makeup as the Official Hair Partner of PHXFW 2013. Following our 8-city tour of the U.S., PHXFW revealed our 12 Emerging Designers competing for the title of ‘Designer of the Year’ at TONI&GUY Academy. On August 9th, 400 fashionistas gathered at Studio 3D to shop PHXFW’s 12 Emerging Designers and take in a fashion show featuring our No7 ‘Model of the Year’ Top 40. PHXFW’s Top 40 models embodied a jet-set lifestyle with special guest Yasmeen for the LAUNCH Photoshoot inside Pinnacle Aviation’s airplane hanger. Phoenix Fashion Week was an official partner of the Scottsdale Polo Championships: Horses + Horsepower, on Friday, November 1st, with a 6:00 p.m. Sunset Equestrian Fashion Show. After state-wide submissions, PHXFW chose the top (4) finalists, who produced their winning sketches and displayed them live at fashion week. The Little Black Dress Challenge winner was Sheri Loraine, presented by Little Black Dress Wines! Along with receiving a $1,000 fashion scholarship, Inspire Fashion T-Shirt Design Contest winner and Collins College student Emery Guzman’s sketch was produced and sold at PHXFW. Contest presented by Cabana modern apartment homes. No7 announced PHXFW Top 40 models Madison and Denis as the 2013 male and female ‘Model of the Year’ Winners, who each received a contract with The Agency Arizona! Las Vegas based luxury line Dolcessa Swimwear was named PHXFW’s 2013 ‘Emerging Designer of the Year’ following a close competition in our Emerging Designer Bootcamp. PHXFW at Talking Stick Resort began on October 3rd with Fashion by Robert Black (left), who brought 1950’s – 1980’s Arizona fashion history. Project Runway Season 12 designer Bradon McDonald (center) produced a fan-favorite collection, and powerhouse Filipino designer Rocky Gathercole (right) closed the week in style on Oct 5th. 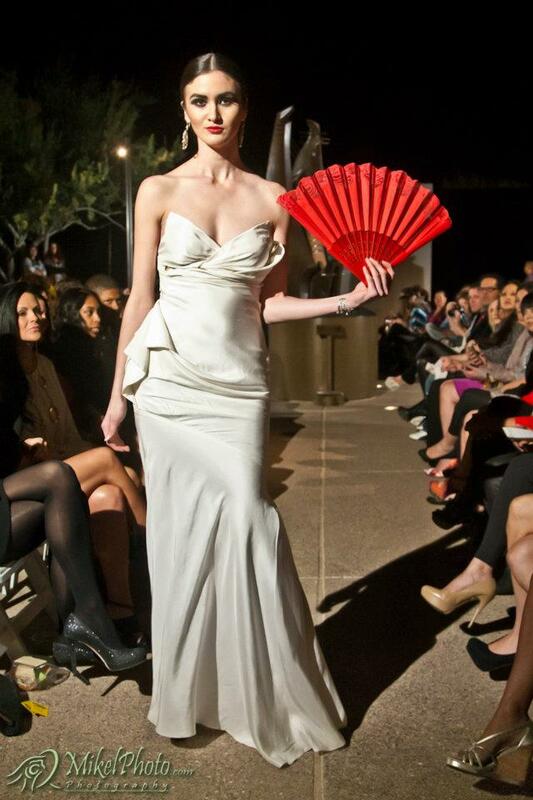 “In wanting to take Phoenix Fashion Week to the next level, we sought out a designer that was already there. Furne One is the real deal. I am still amazed at the quality, production, and vision of this true artist,” said Brian Hill, Executive Director of Phoenix Fashion Week. If these jaw-dropping garments weren’t enough runway drama, America’s Next Top Model Cycle 19 finalist Brittany Brown (and former PHXFW Emerging Model) fiercely worked the runway in a sea foam jeweled gown, while ANTM Cycle 14-runner up Raina Hein (aka wolf eyes) sparkled from head to toe, closing the show in Furne’s bedazzled finale look, covered in thousands of multi-colored Swarovski crystals. Raina also worked her signature smizing look during the pinked out Fashionably Pink show, where she floated down the runway in a custom-made pink chiffon gown with crystal-encrusted sweetheart bustier. This amazing gown was created specifically for the event in support of Susan G. Komen for the Cure. The Fashionably Pink Celebrity Show benefiting Susan G. Komen for the Cure ® Phoenix kicks off Phoenix Fashion Week for the fourth consecutive year on Wednesday, October 3rd. To emphasize the importance of this show, Phoenix Fashion Week has added another day to their calendar, with the show taking place at the Musical Instrument Museum, and the three days following will be hosted at Talking Stick Resort. “This is the fourth year we are raising much needed awareness and funds for Susan G. Komen. 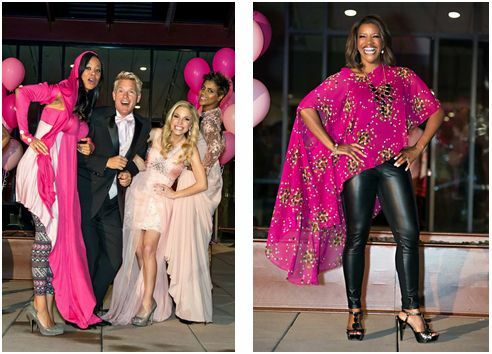 “I am very proud of the work Phoenix Fashion Week is doing for the breast cancer survivors in making them the stars of the runway,” Executive Director Brian Hill said. 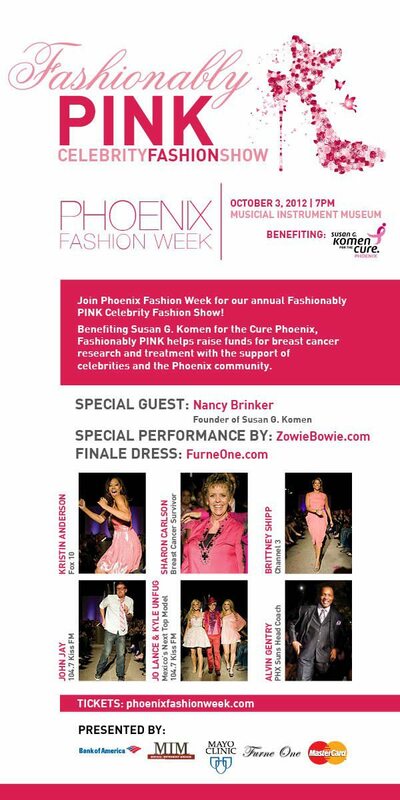 For the first time ever, Phoenix Fashion Week is thrilled to welcome Susan G. Komen for the Cure ® Founder and CEO, Nancy Brinker, as the evening’s honored guest! The night’s supporting sponsors also include Bank of America, Mastercard, MIM and Mayo Clinic.“Mayo Clinic in Arizona’s Cancer Center team is comprised of nearly 200 specialized physicians and scientists dedicated to guiding those with breast cancer through their journey through expert care, state-of-the-art technology and cutting-edge clinical trials.Mayo Clinic’s mission also includes education. It’s important to our team to be out in our local communities supporting events aimed at helping men and women learn about breast cancer awareness,” says Donald Northfelt, M.D., Associate Medical Director of the Breast Clinic at Mayo Clinic. Bank of America is another returning sponsor this year and is thrilled to continue their support of breast cancer awareness and Fashionably Pink. “Breast cancer has touched all of us in some way – family members, co-workers, and friends – and Bank of America is proud to be able to help promote the Susan G. Komen® cause through the availability of Pink Ribbon Banking products,”said Harlan Clark, a Bank of America Senior Vice President for the Susan G. Komen Partnership. “In addition to our product suite, we are pleased to serve as a Race for the CureSurvivor Program Co-Sponsor and the Presenting Sponsor of the Susan G. Komen 3Day Series. The Phoenix Fashion Week’s Fashionably Pink event creates an avenue for us to extend our reach and bring awareness of the partnership to a new audience and we are extremely proud to be associated with the event”. The evening will begin with a glamorous cocktail party at 7pm, featuring a red carpet entrance for photo opportunities, mingling with local tastemakers, live music and a charitable silent auction featuring fabulous vacations to New York City, the Grammys and more, all provided by Charity Fundraising Packages. Perhaps one of the most anticipated looks of the evening is a show stopping pink gown that will close the show by one of the most exciting designers on the global fashion stage, Dubai-based Furne One, whose creations have been seen on Heidi Klum, Katy Perry, and Jennifer Lopez. The evening’s glamorous after party will commence immediately following the fashion show. Don’t miss out on the chicest PINK’D OUT party of the year! To purchase your tickets before we SELL OUT, visit our Eventbrite page! With one of Phoenix Fashion Week’s main pillars being humanity, it’s no surprise that charitable causes are especially close to our hearts and overall mission. We have supported numerous local charities and organizations, most recently at the Luxor Auto Group fashion show, benefiting Angels for Kids of the Boys and Girls Club of Scottsdale. We are thrilled to be partnering on another charitable fashion event this Thursday, hosted by successful local real estate brokerage and investment company, Green Street Realty,LLC. Beginning at 6pm, the evening will be held at Green Street Realty’s beautiful Phoenix office, with a 4th floor patio overlooking downtown and the Biltmore area boasting amazing sunset and mountain views. Filled with networking and delicious drinks and appetizers, this event will also feature a 7:30pm fashion show produced by PHXFW, with the best spring/summer looks from five talented local designers. “Phoenix Fashion Week is excited to work with a great partner like Green Street Realty that really support fashion and charity. In working with Scott from day one, it was about collaborating on a chic fashion event that would give back to our community. By working with local designers and boutiques, we are able to activate our core mission of ‘Bridging Designers & Buyers,” PHXFW Executive Director Brian Hill said. Guests should expect an array of colors, trends and beautiful fashions, with womenswear pieces coming from Ruby Boutique, Mabella Chic, Amelia Walsh and Alma Primero, as well as Biltmore boutique, Bounty Hunter, will show their best menswear looks. “PHXFW is a very well known brand in the community and with our decision to plan a fashion show, PHXFW seemed like the best possible option to help plan the event,” Mertens said. Guests should also expect complimentary swag bags filled with goodies from the evening’s sponsors, as well as opportunities to bid on over thirty amazing silent auction items, including spa gift baskets, a PHXFW VIP Package and even a glamorous designer gown by Alma Primero! As we mentioned, Green Street Realty is focused on supporting their choice charities with as many profits as possible. This is why 100% of ticket sales and silent auction item profits will be donated to the Phoenix Children’s Hospital and Homes for Our Troops, which helps disabled veterans obtain affordable housing. Event sponsors will include Fidelity Title, Fidelity Home Warranty, Knipp Construction and Desert Foothills Exterminating. For more information and to purchase tickets, visit their eventbrite page! Post a comment with your favorite local designer and you could win a PHXFW t-shirt! Local luxury dealer, Luxor Auto Group of Scottsdale, first started in 1992 by brothers Hamid and Sy Salari, will be hitting a major milestone this weekend and lucky for you, they are celebrating their 20th anniversary with a glamorous red carpet event. “Exotic cars and fashion go hand-in-hand. We dress up our cars like fashionistas do with their outfits,” Salari said. Complete with all white decor, cabanas, a fashion show, and even a hookah lounge, you won’t need to travel to Miami for a South Beach destination spot. Enjoy complimentary skewers and sushi and sip on artisanal cocktails while taking in a performance by Myryka, live entertainment by musical sensations Notes from Neptune and spins from local favorite DJ Soulman and DJ Mikyl. A chic afterparty will directly follow at the W Scottsdale. Phoenix Fashion Week is thrilled to be producing the fashion show for Saturday’s event, complete with feminine looks by Carolina Herrera and menswear by local boutique Bounty Hunter. “Phoenix Fashion Week was invited by Luxor Auto Group to celebrate their 20th anniversary by adding a credible fashion element. The owner, Sy, has amazing taste and his expectations are as high as the Ferraris, and Lamborghinis that his dealership touts, and that is the kind of partner that we are honored to work with. This will be an exciting event with lots of activities and not to be missed,” said PHXFW Executive Director Brian Hill. Of course, the PHXFW Style Team will be heading up the fashion preparation and implementation for this event. “In support of our charity efforts, we are very excited to be a part of this amazing event. We will be producing a show featuring fashions from an amazing designer and great local boutique Charity, exotic cars, chic, elegant fashion, this will be a night to remember!” said Style Director Justin Lee. As Justin said, PHXFW is very supportive of local fashion events, especially if they have a charitable nature. It’s amazing to know that family owned Luxor Auto Group will be generously donating any and all proceeds from the evening to the Angels for Kids of the Boys & Girls Club of Greater Scottsdale. Along with ticket and cabana sales, another way they are helping to raise as much money as possible is through a silent auction, which will feature one-of-a-kind sports and celebrity memorabilia, along with an exotic car rental and weekend getaway. In fact, the grand prize is a completely customized Maserati (priced at $70,000) giveaway! “Plain and simple: our kids are the future, so it’s very important to have a support system in place to ensure that our youth has a great future,” Salari said. With general admission tickets starting at $25 (includes entry, 2 drink tickets, and 1 raffle ticket), it’s a great way to affordably spend a glamorous weekend! Tickets are available through personal invitation or for purchase to the general public through their website. For more information, visit the event FB page! By the way, Carolina Herrera will be hosting an uber chic evening at their Scottsdale Fashion Square boutique next Tuesday, with all the looks from Saturday’s Luxor fashion show at 10% off! To RSVP, see the flyer below!